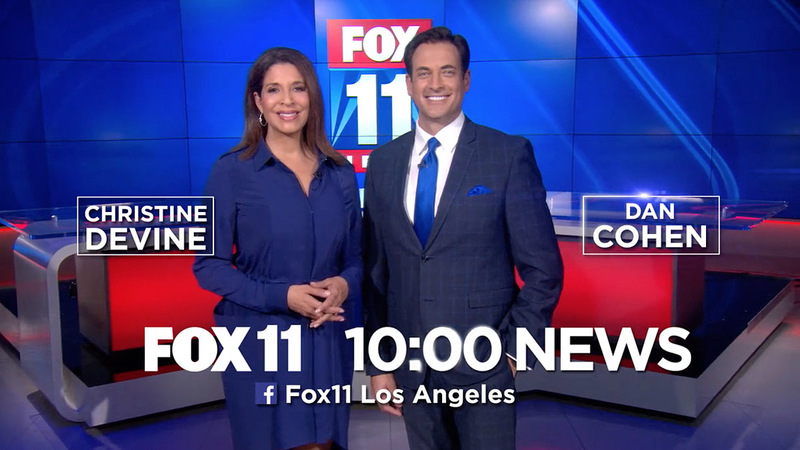 KTTV, Fox 11 Los Angeles, will see changes Monday, January 22nd, as Christine Devine and Dan Cohen take the reins of the station’s 5 p.m. and 10 p.m. newscast. The pair promises a 10 p.m. “unlike any other” in a new promo that also teases a studio upgrade, with the talent in front of a new anchor desk and sweeping monitor wall. The promo goes on to mention fast-paced and hard-hitting coverage, zooming between the anchors, a control room and reporters in the field. Cohen relocated to Los Angeles from KFMB in San Diego, joining Devine, who’s been a mainstay at Fox 11 for 27 years. Fox 11’s previous studio, from JHD Group, debuted in May 2013.